ICD is the World Health Organization's (WHO's) International Classification of Diseases (ICD) and Related Health Problems and is the international standard diagnostic classification system, and is the tenth revision of the ICD. The ICD is the coding system which physicians and other healthcare providers currently use to code all diagnoses, symptoms, and procedures recorded in hospitals and physician practices. Today, the Department of Health and Human Services (HHS) just published an updated rule for the adoption of ICD-10 code sets. HHS is requiring that all HIPAA covered entities must be ICD-10 compliant by October 1st, 2015. This newly updated compliance date is meant to be firm and not subject to any change. This is the third time that ICD-10 has been delayed, so I strongly suspect that this new deadline will be met by next fall. Last year, I put together a visualization of analysis of the ICD-10 coding landscape. 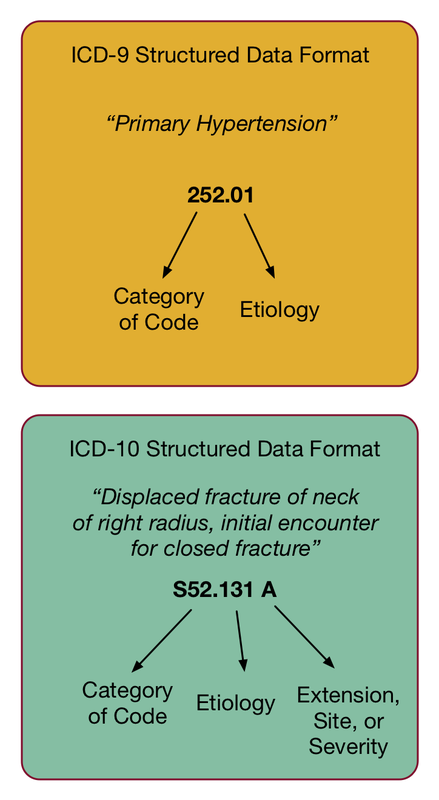 Below is a simple primer explaining the distinction between ICD-9 and ICD-10, demonstrating structurally the difference in the two coding systems. In particular, the ICD-10 code set has been expanded from five positions (first one alphanumeric, others numeric) to up to seven positions. The codes use alphanumeric characters in all positions, not just the first position as in ICD-9. As of the latest version, there are ~68,000 codes in ICD-10, as opposed to the ~13,000 in ICD-9. More specifically, there are nearly 5 times as many diagnosis codes in ICD-10 than in ICD-9 and there are nearly 19 times as many procedure codes in ICD-10 than in ICD-9. Yikes! The new code set provides a significant increase in the specificity of the reporting, allowing more information to be conveyed in a code. To support this, the terminology has been modernized and has been made consistent throughout the code set. There are codes that are a combination of diagnoses and symptoms, with a claim that fewer codes need to be reported to fully describe a condition.